This weekend’s adventure takes us to the Niagara Whirlpool on the Canadian side of the majestic Niagara Falls. 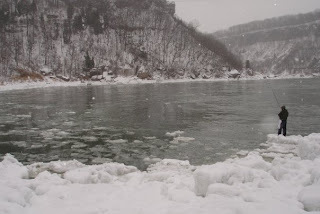 The Whirlpool is a section of the Niagara River where it makes a sharp right-angled turn and water circulates in a counterclockwise direction (most dramatically from November to April). The whirlpool reaches depths of up to 120 ft (38 m) and water rushes through its rapids at about 30 miles per hour. If this doesn’t spell danger, what does? The reward of being a true gladiator of the outdoors and facing the obvious trenchers of the whirlpool is a chance to catch really big fish. Depending on the time of year, you can catch everything from Smallmouth Bass, Trout, Carp and even the fish of 10,000 casts Muskie! Just two years ago if you wanted to fish the shores of the Niagara Falls Whirlpool you had to prepare yourself for a treacherous hike down a narrow unpaved trail and a proper pair of hiking boots would have been strongly recommended. Today there is a wooden staircase that you can take halfway down the trail (the rest of the journey is a pretty easy hike to the shoreline). Anyone in average shape (whatever that means these days) can make it down to the bottom of the gorge in about ten minutes. Climbing back uphill is a bit more challenging and will surely put the burn on your quads. With that being said, the scenery is absolutely beautiful so put on a pair of shoes with reliable grip, do a quick warm-up stretch and start hiking. Just remember that although the installation of stairs may have made the hike down less dangerous, the whirlpool is just as furious as it was before the stairs. Although Niagara is famed for being one of the top honeymoon destinations in the world, this trip will be no romantic escapade (unless of course you count our love for fishing and the outdoors). We will trade in our hotel room for a tent which we will setup on a small ridge about 60 feet from the water. Our bathroom will be the safari toilets located a few feet from our four star lodging. Camping out in the gorge will give us the opportunity to take our first cast right when the sun is rising. This is also the best time to catch the monster Muskie that come closer to shore for an easy breakfast meal. Naturally, there is a myriad of hotels, motels and inns close by if you prefer a bit more comfort. Check back for pictures, videos and sound bites of this adventure. In our upcoming posts we will provide some lure recommendations and potential hotspots around the whirlpool where you can go for the big one. Be sure to visit www.twitter.com/fishtalker for an up to the minute update of our spills and thrills. how do you get to the staircase?? ?